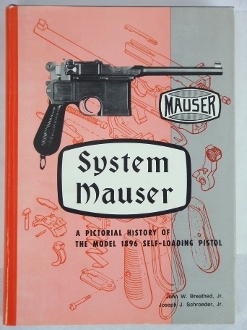 Book Details: Illustrated reference and history of the Mauser 1896 self-loading pistol. Book references the 1896 pistol, Mauser Cone Hammer model, Large Ring Hammer model, Mauser 1920, Mauser 1930, Schnellfeuer, Mauser Bolo, Mauser flatside pistol, Broomhandle pistol, Parabellum, Mauser Banner, Mauser Persian contract, French Gendarme, Mauser 1896 carbine to name some. Book shows very little use. Hard cover 7 ½” x 10”.